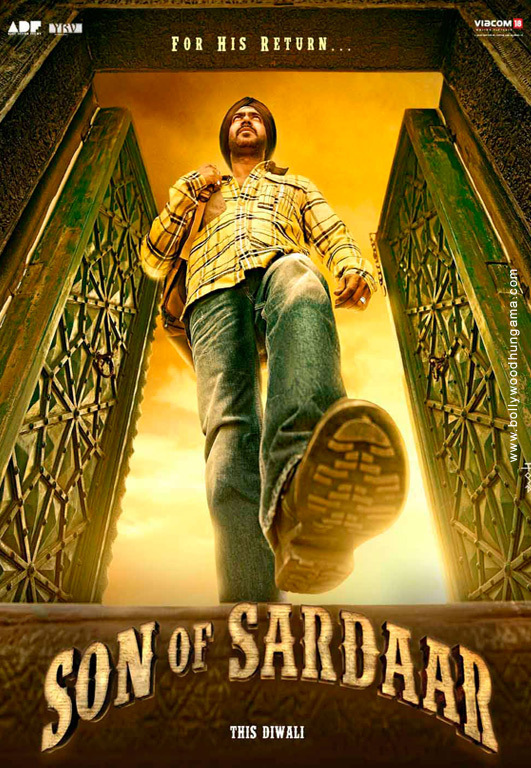 There are very good expectations from the music of Son of Sardaar. First and foremost this is an event film and its Diwali release coupled with the fact that it's lead actor is Ajay Devgn (who has been a regular on the festival for quite some time now) means the film can't afford to go wrong on music. Moreover Himesh Reshammiya has been roped in for this musically heavy album with as many as seven original songs (along with the remixes, reprise etc.). With an assortment of lyricists contributing with their words, Son of Sardaar album is obviously much awaited. The album kick-starts on a high note with the title song 'Son Of Sardaar'. With addictive beats bringing the song on course in the very first minute, this Hinglish number written by Shabbir Ahmed has been given an out and out 'bhangra' treatment by Himesh Reshammiya who also comes behind the mike along with Aman Trikha. With a folk base to it, the song starts off quite well but has an uneven pace to it due to which it doesn't become the crackerjack number that one would have expected at the very beginning. Still, just the sound of three key words - Son of Sardaar - does manage to get the song and it's 'remix' noticed. The song that does turn out to be a notch above is Sameer written 'Rani Tu Mein Raja' and it's 'remix version'. Starting off quite well with Yo Yo Honey Singh putting his rap to good effect here, the song gets on track without wasting a single moment, what with Mika Singh rendering it at his energetic best. A rhythmic number with a good touch of melody to it, 'Rani Tu Mein Raja' is further enhanced by newcomer Bhavya Pandit who brings in the right blend of fun-n-naughtiness in her voice which goes well with the song's fun quotient. Also, it is clear that Himesh has been inspired by Lakshmikant-Pyaarelal School of music here. Lyricist Shabbir Ahmed returns with 'Po Po' and on just reading the credits one does wonder what the song would indeed have to offer. As it turns out, 'Po Po' continues the Punjabiyat of the album with Hindi-English-Punjabi combo put to good use here. A quintessential 'desi' dance number which is high on energy and is poised to find its way in celebrations at North Indian households as well as discotheques/clubs, it has Vikas Bhalla, Aman Trikha and Himesh Reshammiya clearly having fun while singing at a high volume. The song that follows pretty much seems like an extension of 'Po Po' with the tune being varied just a little. 'Tu Kamaal Di Kudi' written by Manoj Yadav has a similar celebration feel to it and Vineet Singh along with Mamta Sharma can pretty much be visualised dancing to this one even inside the studio. While the song manages to hold your attention and also convey loud and clear that the idea behind the soundtrack of Son Of Sardaar was to keep the tempo high right through its duration, one does end up wondering whether the film would actually fit in so many 'bhangra' numbers one after another in its running length! Well, one does get the answer with 'Bichdann', a song which is clearly the best bet of the album. A vintage Himesh Reshammiya number, 'Bichdann' starts with Ajay Devgn rendering a couple of lines before Rahat Fateh Ali Khan takes over. A soulful number boasting of some very good arrangements, 'Bichdann' is a beautifully composed, written (by Sameer) and sung that also manages to bring certain 'thehrav' in the album. If you have liked the songs of 'Ahista Ahista' and 'Kajraare', this is the one (along with 'reprise') for you. It has the potential to cover the kind of distance that 'Main Jahaan Rahoon' [Namastey London] did. The mood is sustained with Irshad Kamil written 'Yeh Jo Halki Halki Khumariya' which continues from where 'Bichdann' left with Rahat Fateh Ali Khan continuing to be in good form. This one sounds like a much easygoing version and has a much more romantic feel to it than being pensive. A Sufi number with a slight Western touch given to as well, 'Yeh Jo Halki Halki Khumariya' has a good melodious touch which should ensure a good success in the long run. Meanwhile one waits to see how this is incorporated in the film. An experiment that doesn't quite all the way though is Ajay Devgn's narration of 'Kabhi Kabhi Mere Dil Mein Yeh Sawaal Aata Hai' which has dominated the film's promotion for months now. While lyricist Ashwni Dhir's hailing of Sardars has made a very good impression when heard in the film's promos, Sandeep Chowta's 'Funk' version and 'House Track Trance' version in the album doesn't really make the desired impact. In fact it would have been retained as-is, the overall effect would have been much better. Son Of Sardaar lives up to its promise of a high-on-energy soundtrack with not many dull moments in its 50 odd minutes duration. While the entire album has a North Indian flavour to it (as expected) with 'bhangra' numbers dominating it all through, there are a couple of Sufi numbers that add on to the 'paisa vasool' element. Moreover the songs are also expected to do quite well in the context of the film and even though they may not come with a 'memorable' tag, they do well to ensure that the screen indeed lights up when they play on along with the film.